While food is one of the two fundamental pillars of human survival -- water being the other -- how often do we stop to think about food in a socio-cultural sense? For Zeynep Kilic, sociology professor, Fulbright Scholar, and Turkish transplant in Alaska, Turkish food has been the link between her new world in the US and her upbringing in Turkey. While food is one of the two fundamental pillars of human survival -- water being the other -- how often do we stop to think about food in a socio-cultural sense? For Zeynep Kilic, sociology professor, Fulbright Scholar, and Turkish transplant in Alaska, Turkish food has been the link between her new world in the US and her upbringing in Turkey: "My dinner table has always functioned like a bridge between my social network in my new country and myself, shortening the distance between us," Kilic narrates in her documentary Tables of Istanbul, currently making the festival circuit around the world. "Whenever I want to make friends I seduce them with Turkish food," she says with a welcoming smile. But it is not only the warm familiar tastes of home she craves in Alaska's icy climes, she is also curious about how the immigrant experience shapes the foods we eat and how we prepare them. But what is on the 'authentic' Turkish table? Kebap? Is the Turkish kitchen in our minds simply a jumble of clichés? As I keep urging my students to stay away from generalizations, am I following my own advice?" This desire to unpack the meanings behind Turkey's foods and flavors led Kilic far from her new home in Anchorage to Istanbul, a city that itself has been a bridge between cultures for thousands of years, in search of a more comprehensive understanding of what Turkish cuisine actually means and how it is shaped by this enormous history of migration, colonization, and transformation. What she found from interviewing restaurateurs, chefs, activists, food writers, and families is that the core of what makes Turkish food Turkish is far more complicated than she'd expected, and the flavors of all these different and sometimes contradictory perspectives makes for a hearty visual and ideological meal in and of itself. "Food culture is very old, perhaps the first culture humans developed. Sitting together comes before the marital institution. Humanity has progressed as we sat around the table together, as we shared what is on the table. Wherever people could share more food and give more to others, the more humanity flourished." "All inequalities start with food, at the table, then moves onto clothing, to where you live etc. but it starts with the food culture. You can wear the same outfit for a month but you have to eat every single day. Therefore food is where we first notice the inequalities." "Right now we are in an area where the poorest of the city, especially the Syrian refugees live. You are at a restaurant such as this, you have the luxury to order whatever you want and two streets down there are people who don't have bread. How could you swallow that food?" Many of the restaurateurs interviewed by Kilic in the film mention that the cultural stratification of Turkish food goes back hundreds of years into its Ottoman history, where the royal kitchen produced certain types of foods and with a variety of exotic ingredients passing through the silk road, all the while peasant dishes remained a staple as well as being geographically specific to various areas of Turkey. A king's table and a worker's table were two very different things, but so were an Istanbul table and an Anatolian table. Today, with such huge migration patterns and constant influxes of people from around Turkey and even its neighboring countries into Istanbul, the city is seeing what can be called the democratization of food. Batur Durmay, the general coordinator for Asitane Restaurant comments on the oxymoron of people ordering a $15 salad in a fancy restaurant for lunch and then going home to eat street food from a corner shop. While this might be usual behavior in the West, this is a new food experience for Istanbulites. "There has to be a certain level of hybridization. As a result, some interesting things materialize. Take Beyoglu for example. Beyoglu is...shaped by Art Deco, has a very interesting, amazing structure. In that framework you see a woman from Van making gozleme. This is actually a paradox, but over time you internalize this. That I can go to Beyoglu, to eat gozleme, or to have wine, or to go to disco, or shop at an exclusive shop. Hence many different stratas start coming together. They used to be separate. Now they all work together." "He eats mıhlama and hamsili ekmek (Black Sea regional foods), çiğ köfte and baklava (Southeast specialties); consumes all. This is not us. This is urban macho aristocrats creating a city food culture. When we fuse them all together, we experience a loss of identity." "Perhaps we can call it cuisine of Turkey rather than Turkish cuisine. Turkey's cuisine is an anonymous one. This is a topic of debate. In other words, some people consider it a fusion cuisine. I don't think it's out of place to say so because everyone influenced everyone else. Using the term, 'anonymous' is also accurate because there is a coherence to it. Just like ebru (marbling art), we are intertwined, while ethnic groups retaining their distinct character. Turkish cuisine is multicultural and this is where its abundance comes from." "I told them, please, do not be a chef, be a cook. Don't be ashamed of kurufasulye (broad bean stew). It is our symbol. No matter where you are, if you see a person eating onion with kurufasulye, you know that's a Turk. This is a symbol. Don't be ashamed of menemen, or onion stew. These are all our values." "Before we talk about who these dishes belong to, let's consider if we are able to protect & preserve them. One of the most well known dishes from the olden times is uskumru dolmasi (stuffed mackerel). Highly unlikely anyone makes it these days because there is no mackerel left. It is so meaningless to discuss the ownership of dishes after they disappear. Hence one of the most important things we must do is conservation of local products." Tables of Istanbul is not only a visual feast, but a sociological banquet as well. If you're familiar with Turkish food your mouth will water for those familiar flavors and you can almost smell the dishes through the screen. If this is a cuisine with which you aren't yet familiar, you'll be looking to Istanbul for your next culinary adventure. And for the discerning cultural critic, there are so many fascinating concepts and questions posed in the film to leave you mentally chowing down for days. As for me, a biracial Third Culture Kid without a fixed culinary tradition in my life, Kilic's musings in Tables of Istanbul has me approaching the food I cook and eat with an entirely fresh perspective that now takes into account the cultural history of products I regularly cook and consume, which actually has me tasting and appreciating food on my Florida table in a whole new way. 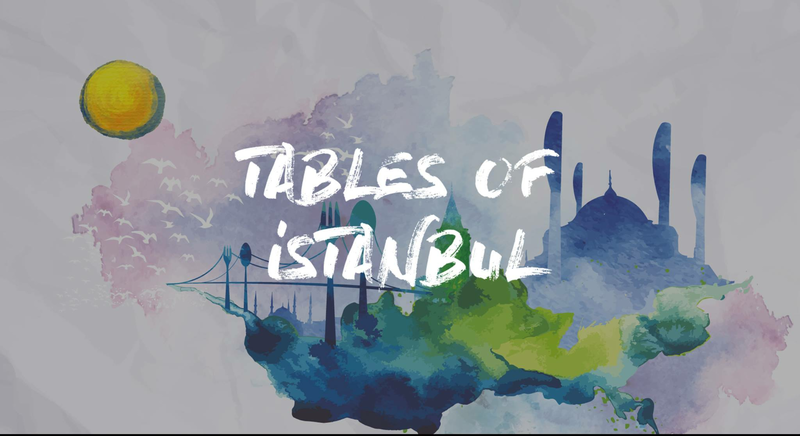 "To tell you the truth, during my Istanbul adventure, I enjoyed conversations around the dinner table the most. And maybe I need not worry too much about my food preferences, about the 'why's and 'how's. Perhaps it is enough to see another bridge built through my cooking. And maybe, just maybe, all that matters is to cook with love, eat with pleasure, and break bread surrounded by friends and family."